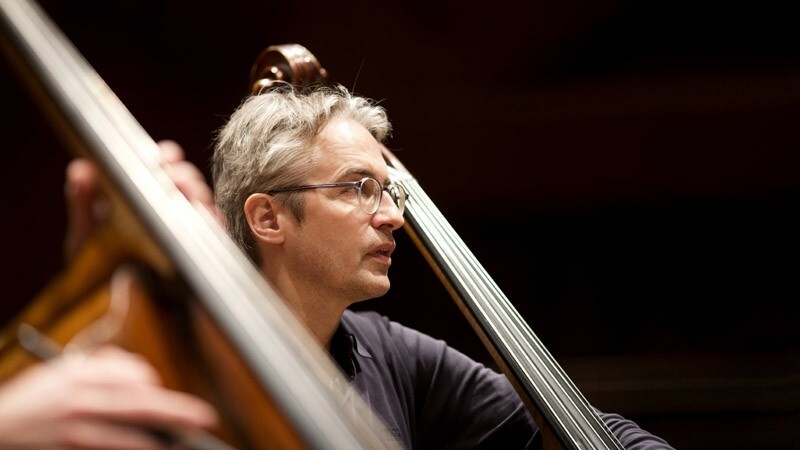 Frank Reinecke was born in 1960 in Hamburg, took his first violin lessons at the age of five, and then began to teach himself the double bass when he was fifteen. After graduating from secondary school he studied with Klaus Stoll at the Academy of the Arts in Berlin. At the age of 23, he was engaged by the Symphonieorchester des Bayerischen Rundfunks. From 1995 to 2001 he served at the Mozarteum in Salzburg, first as assistant to Klaus Stoll, later as honorary professor of double bass. As an interpreter of New Music, Frank Reinecke has performed world premieres of a number of solo and chamber music works and has been a guest artist at several international festivals. He has played with the German Wind Soloists, the Haydn Trio in Vienna, the Ensemble Villa Musica, the Prazak Quartet, the Henschel Quartet, the Linos Ensemble, the Pro Arte Quartet in Salzburg, the Ensemble Recherche and the Xsemble. He has given master classes at the International Summer Academy in Salzburg and the Mühldorf Summer Academy. His long-term collaboration with Norwegian violinist Helge Slaatto gave birth to a special repertoire for violin and double bass. Prominent contemporary composers including Niels Viggo Bentzon, Thüring Bräm, Nikolaus Brass, Morten Skovgaard Danielsen, Peter Michael Hamel, Wolfgang Heisig, Sven Lyder Kahrs, Hanna Kulenty, Hans Lüdemann, Enno Poppe, Nicolaus Richter de Vroe, Erhan Sann, Wolfgang von Schweinitz, Wilhelm Dieter Siebert, Manfred Stahnke, Erkki Sven Tüür, Isang Yun, etc. have written works for the duo. They have performed in Germany, Denmark, Norway, Italy, Austria, France, Greece, Armenia, Luxembourg and the United States. Several CDs have already been released. The recording of the “Plainsound Glissando Modulation” by Wolfgang von Schweinitz was awarded the “Deutscher Schallplattenpreis”.